Newton Running’s patented Action/Reaction Technology™ encourages a midfoot strike and helps runners be faster, more efficient and incur fewer injuries. With highly responsive cushioning and protection, plus enhanced ground feel, Newton Running shoes actively support you as you rediscover and strengthen your natural running motion. Designed to provide a more level-to-the-ground platform with minimal drop – like your feet, these lightweight, comfortable shoes help you find the right position as you run. No other shoe offers the true POP (Point of Power) sensation found with Newton. While the POP platform differentiates the shape, ride and feel found in the Action/Reaction Technology™, Newton Running’s new 2014 5-Lug technology accommodates the splay of all five metatarsals, provides a broader and more stable platform, increased ground communication as well as feels faster and more efficient. When you put all of these elements together, you will find yourself running better and feeling more joy. HELLO BETTER! 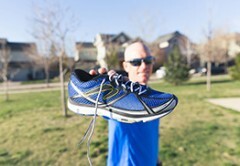 Boulder, Colorado-based Newton Running is the leader in natural running footwear and education. Newton Natural Running™ form clinics teach runners how to run naturally and Newton Natural Running™ Coaching Certification Programmes provide trainers and community leaders with the tools and techniques to teach natural running principles. Newton Running also supports numerous charitable organizations, athletes and events.